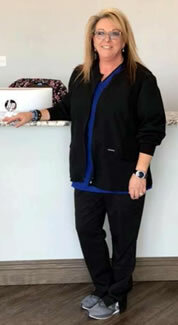 Sheila has over 25 years of optical experience, specializing in repairing, adjusting and fitting eyeglass frames. She is equally experienced in surfacing and edging of prescription lenses and has a vast knowledge of all lens materials and coatings. She was the office manager for the last 17 years at her previous employer. She is very excited to take on the position of Office Administrator for Dr. Kevin Gardner here at 4 States Vision Express. Personally, Sheila is married to Bill Harper and has 2 sons, Brett & Willie. Bill works for Culligan of Joplin. Sheila is a member of the Webb City Park Board. She enjoys volunteering in the Community, repurposing furniture and woodworking with her Mom but, most of all spending time with family and friends. Sheila would love to help you and your family find the best fit, style and, price for all your eyecare needs.